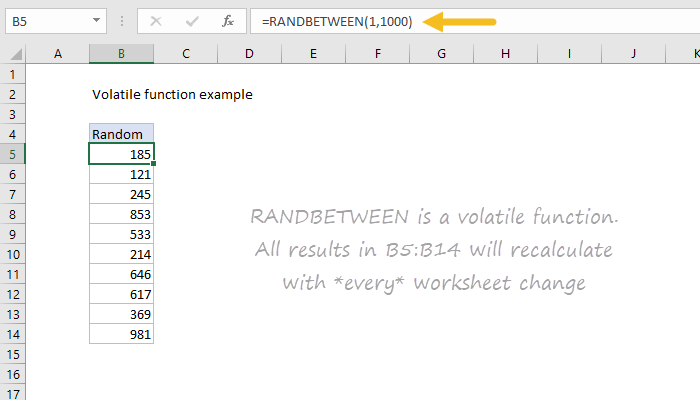 A small number of Excel functions are "volatile". Volatile functions trigger recalculation on every worksheet change, so they can have a drastic impact on worksheet performance. In workbooks that contain a small amount of data, the performance impact may not be noticeable. But in workbooks with large data sets and lots of formulas, adding a volatile function can make the worksheet feel sluggish. In extreme cases, this can make a spreadsheet almost unusable.